Bolivian President Evo Morales has abandoned a public event in the face of an angry protest over food shortages and price rises. "The government took the decision not to respond to shameful provocations of this kind," presidential spokesman Ivan Canelas said. Setting off dynamite is a common feature of trade union protests in Bolivia, where the explosive is widely available to miners, but injuries are rare. In the eastern city of Santa Cruz - an opposition stronghold - protesters blocked the road to the airport to demand the government scrap an agency set up to promote food production. The protesters say the agency - known as Emapa - is inefficient and discourages private business. Smaller protests were also staged in La Paz and the central city of Cochabamba, although marches were called off because of bad weather. 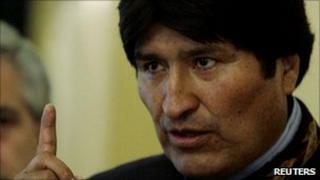 President Morales is facing a wave of protest over rising food and transport costs and a shortage of sugar. The left-wing leader's popularity has fallen sharply since the beginning of the year, when he abandoned plans to cut fuel subsidies in the face of popular protests. Some of the protests have been led by social movements that supported Mr Morales as he rose from being a radical peasant leader to win election as Bolivia's first indigenous president in 2005.